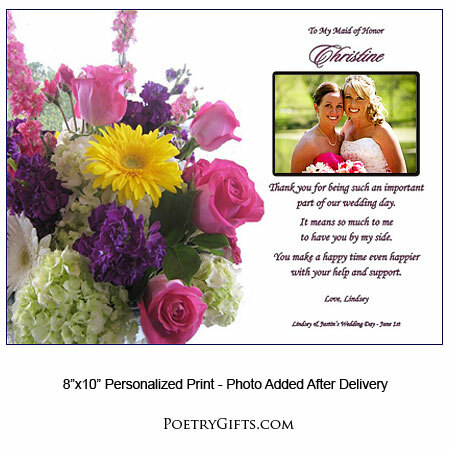 When you want to thank your bridesmaids, maid of honor, or matron of honor from the bottom of your heart, here is a bridal attendant gift that says "thank you" in a heartfelt and personal way. This special gift is personalized with names and wedding date. 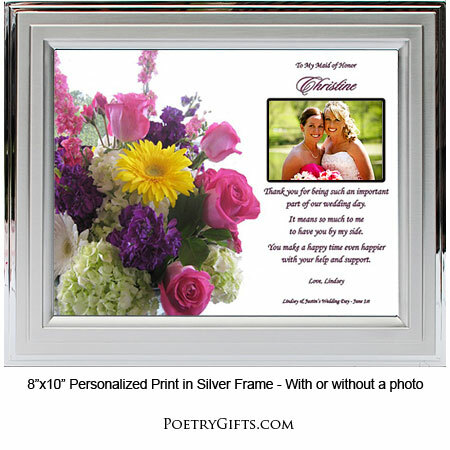 Add a photo of the bride with her girls to make this a wedding keepsake to cherish. Girlfriends have a way of making everything more fun. On your wedding day, let your Bridesmaids and Maid/Matron of Honor know how much you appreciate them standing next to you on the most important day of your life. 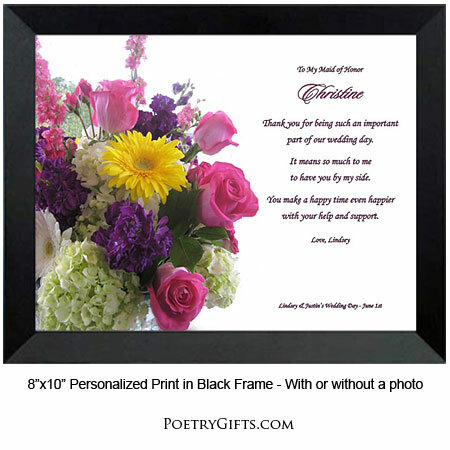 This "Thank You for Being My Bridesmaid" Poetry Gift will speak what's in your heart. It is a personalized present you will be proud to give your girls. Frame this beautiful print in any standard 8" x 10" picture frame or choose one of our contemporary frames. ($19.95 is the unframed price) A perfect time to give your attendants this keepsake is at the rehearsal dinner. Or maybe when your friends are showering you with all kinds of gifts, you can in turn present them with this meaningful and touching "thank you" gift. 3. Closing Phrase and Your Name (as seen after poem) - (Examples: Thank You For Everything, Lindsey; With Love, Danielle, etc.)" 4. Optional Phrase and Wedding Date - (Example: Troy & Anna's Wedding Day - April 15; Paul & Sophia's Wedding - October 5th)"
part of our wedding day. with your help and support.